We've gone through a number of New Year's "traditions" over our years of living in the Midwest. There were several party years, until one year, the day before the party, the hosts announced they were breaking up, and the party was canceled. That was the year I convinced my friend Susan (also an attendee of the former "party") that we should all go to a New Year's Eve contra dance. That started a new tradition of dancing the night away — four hours of high octane dancing followed by a midnight dessert potluck. We did this for more years than I can remember, and it was great fun. Then, with my parents getting older and living in a condo in Florida, we started spending the holidays with them. New Year's Eve consisted of an early dinner at a Chinese restaurant, and that was pretty much it. After my mother died, we continued spending the holidays in Florida with my father, and later, my father and Rose. The restaurant would occasionally change, but not the scenario. The evening was mostly quiet and early, except that there was usually an "incident" involved. My father was not a patient man, and the incident may have been precipitated by something as seemingly insignificant as having to wait too long at the restaurant, or having the menu options changed from the last year, but it always created a bit of discomfort. My brother and sister-in-law, who live in Florida, sometimes joined us, but occasionally the "incidents" would become too much for them, and they would skip a year or two, much to my dismay. One "incident" I particularly remember was the year I broke off the key in the lock to my father's front door. We had just gotten home, and it was cold, dark and later than usual (for us) and we had no choice but to go back to Rose's condo to get a phone book and seek out an emergency locksmith. (My father needed all sorts of medications that were inside his condo, and there was no way he would have waited until morning.) After several failed attempts, I finally reached an unlucky locksmith with a cell phone. He was obviously at a New Year's party with his wife, and I could hear celebration (and her distress at his leaving) in the background. He was a good 45 minutes away, and when he finally arrived, he could only do a temporary fix on the lock, which would have to be replaced the next day. Whew. I won't go into any more details but it was quite a night. Last year was the first New Year's without my father, and my two brothers and I spent our time in Florida emptying the condo. I honestly don't even remember where I was on New Year's Eve. It seems erased from my memory. This year we will spend a quiet evening at home. We went to a "night before New Year's Eve" contra dance last night with Susan and her new fiancé, and had so much fun my husband and I decided we should start dancing again. But today I'm feeling quiet and a bit nostalgic. I hope all of you have a happy and healthy New Year. I look forward to reading your wonderful blogs in 2009. P.S. Don't forget to eat black eyed peas for good luck in the new year! Here's an easy and delicious recipe for Texas Caviar, or Black Eyed Pea Salsa. I've only been to Mexico once, and it wasn't what I'd consider a "real" travel experience. I went to a conference in Cancun with my husband. He was a keynote speaker and the conference organizers had offered to bring the spouses of the main speakers to the conference all-expenses paid. At first I declined the invitation, not being a fan of large resorts in artificial settings, but then I had a last minute change of heart, and decided it would be more weird to not go than to go. After all, it was January and cold here, and January and warm there. The resort was pretty much what I expected, but I did my best to be friendly and join the other spouses each day for beach going, shopping and relaxing. I took the bus to the tourist malls and bargained for jewelry (a bracelet that I still wear every day), and soaked up the rays and breezes on the beach. I do love to walk for a couple of hours on a beautiful beach, but the previously storm-battered and sadly eroded beach was not what I had envisioned. It was very narrow and filled with cabanas, and the sand at the water's edge, where I like to walk, slanted at about a 45˚ angle and was mushy instead of firm. After a short stroll, one leg hitting the sand at a much higher point than the other, my hip began to ache, and instead of enjoying the sight of miles of ocean lapping at sand, I envisioned a chiropractic adjustment table in a sterile room, and knew it was time to return to my cabana. The resort was unwilling or unable to make vegan food accommodations beyond plain pasta with no sauce, so we opted to bus into town for our meals. We found a small chain of natural foods restaurants that served amazing local foods. The meals were so delicious that we tried repeatedly to lure other conference attendees to come with us, but they were all frightened of the word "natural" and chose to eat at the hotel instead. Interestingly, a large number of the group started disappearing. We later found out they had succumbed to dysentery and were recovering in their rooms. Although we ate enthusiastically, neither one of us ever had any problems. I just wish I had taken notes and photos so I could remember and recreate the wonderful traditional Mexican food we ate. And this brings me to Rick Bayless. 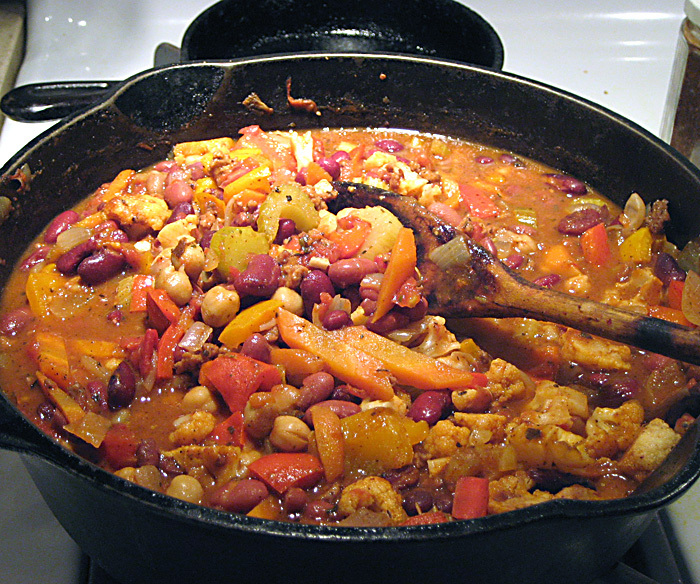 At first glance, Mr. Bayless seems to cook only animal-based Mexican dishes—with lots of chorizo and lard. Not exactly vegan food for thought. But, if you look beyond that first impression, you can find lots of inspiration for amazing meals. He was recently in Madison for a fund-raising event at which I was supposed to help, and I was really excited to meet him and watch him cook in person. At the last minute, I was unable to attend. I was very disappointed, but had a post-event opportunity to purchase one of his (signed) cookbooks for half-price. There were two choices, and I poured over each one, trying to determine which I was more likely to use. I chose "Mexican Everyday" instead of "Authentic Mexican 20th Anniversary Edition," because it contained meals you could make in 30 minutes. But the latter contained a treasure trove of information and would be a wonderful reference book. He provides so much insight into the flavors, ingredients and techniques involved in authentic Mexican cuisine, it's relatively easy to adapt the dishes into vegan versions without losing the fabulous taste. 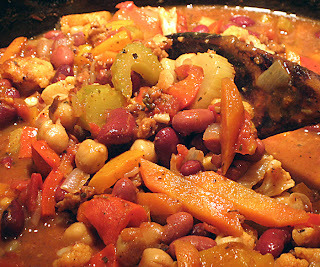 Plus, for many of the dishes in the book I selected, he offers vegetarian alternatives. And the side dishes and vegetables sound amazing. For example, you can skip the pork but make the Smoky Roasted Sweet Potatoes with Guajillo Salsa. I'm looking forward to substituting tofu, tempeh, seitan, beans, avocados and eggplant or other veggies for the animals, and using the preparation methods and sauces from the book, to create exciting flavors. 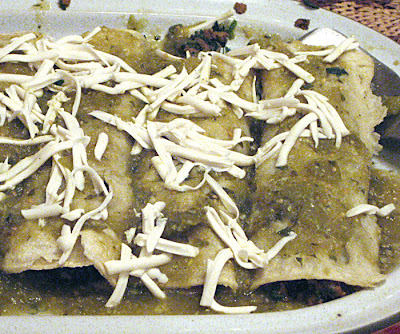 Our first try was Tomatillo-sauced enchiladas with spinach and mushrooms. We had only a few tomatillos in the house so we supplemented them (as per Rick's suggestion) with bottled tomatillo salsa. For the spinach we used a 12-ounce bag of chopped frozen spinach. We used eight ounces of white mushrooms, and we substituted vegetable stock for chicken stock and left out the shredded chicken (which is listed as optional in the recipe). We have lots of frozen jalapeños and other hot peppers from our garden, and we used those instead of fresh. 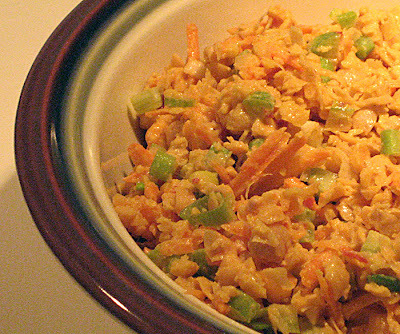 This dish was easy to make and so delicious I had to force myself to stop eating. And following Mr. Bayless' easy method for softening corn tortillas, the tortillas were so much better than any we had prepared before. If you would like the revised recipe, e-mail me. After reading about so many of your amazing Thanksgiving celebrations, I'm finally getting around to noting ours. We went to a potluck celebration at our friends' house in the country, and the amount and variety of food was astounding. Naturally, I forgot to bring the camera, but you can get a little sense of the celebration here. For our contribution to the meal, I made stuffed roasted seitan and apple-cranberry sauce. My husband made delicious chocolate chip cookies. I photographed the seitan still in its baking dish (top photo) before we left the house, and we took the serving platter with us. On the plate l'm showing leftovers that we had the next night, since as I said, I didn't bring my camera to the event. The seitan was stuffed with brown basmati rice, wild rice and whole wheat bread cubes with onions, mushrooms, garlic, celery, chipotlé, dried apricots and I can't remember what else. One of these days I should write down a recipe so I can make it the same way twice, but it hasn't happened yet. 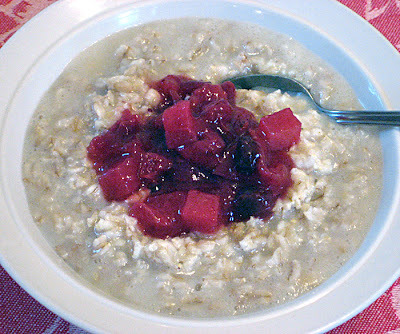 And this is my after Thanksgiving breakfast—oatmeal topped with cranberry-apple sauce. Wisconsin is a big cranberry growing state so both the cranberries and the apples were local.